Once again, I found myself flying from Manchester, NH in to Reno, NV, as I had just slightly over one year previously. 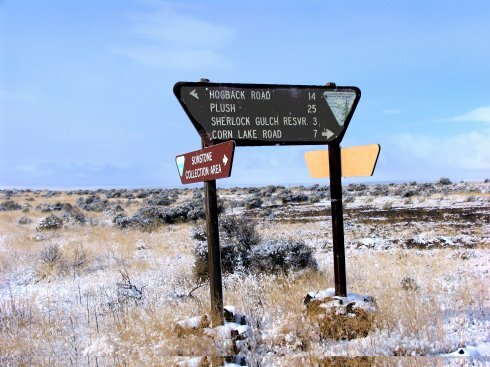 My goal was the same as it had been then - drive from Reno up past Plush, OR to one of the high deserts within Oregon where I would spend a few days at the Dust Devil Mine in search of Oregon Sunstone! This was actually something to look forward to, since some time had passed, and I was missing the thrill of uncovering something hidden in the ground since it's formation when the earth was much younger. I must admit though, the long flight of up to 12 hours, the several hour drive, the 'roughing it' and the extreme temps should all make me say 'once is enough', but I do find the isolation, the terrain, the natural beauty, the roughness and flora/fauna to actually be a draw, as it is very different from New England. 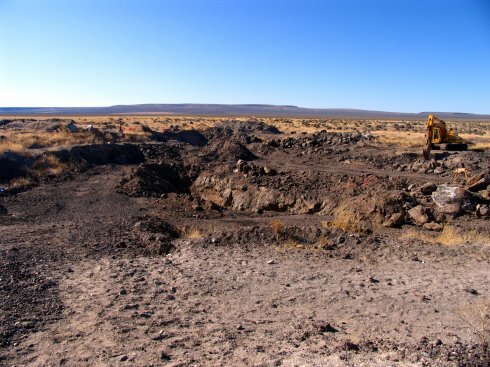 The Dust Devil Mine, outside of Plush, Oregon, is one of a number of privately owned mining areas, where one can pay a fee to dig for Sunstone, a type of Feldspar which frequently contains copper platelets (called schiller), which gives Sunstone it's name. 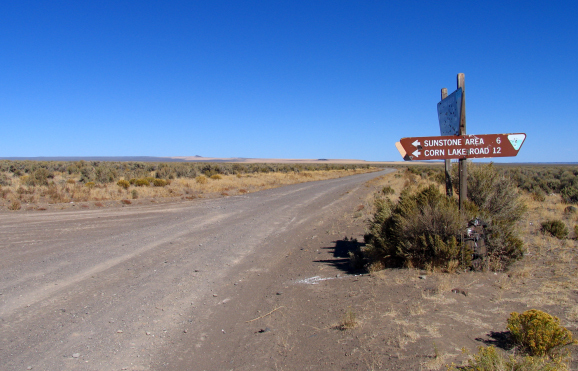 There is also a section of public land where one can also seek Sunstone for free. The main body colors of this gemstone can be clear, straw, yellowish, orangy, reddish to even green which is fairly rare. Some pieces may actually contain more than one color, to the point where it looks like watermelon, with green, red and clear. 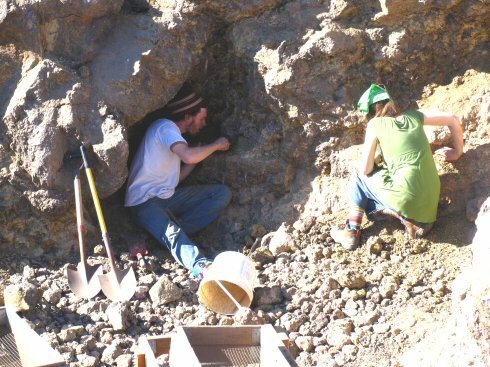 The material can be found in decent abundance, and anyone entering these areas is guaranteed to find Sunstone; the finer pieces with color or schiller, are less common and one might have to dig with tools in order to find the best material, and again, it is all luck as to what you might find. My trip in 2007 produced only smaller pieces with some faint schiller with only one small piece showed a spot of color. When one calculates that it cost a few thousand dollars to fly from the East to the West Coast, stay in a hotel in Reno, rent a car, drive about 6 hours north, dig for several days, drive 6 hours back to Reno, return the rental car and fly back to the East Coast, one must really strike the motherload in order to recoup expenses. When I was there last in July of 2007, the sun was strong and the temps high during the day. I had joined a number of those in the trade who facet and sculpt for a special Dig In event. I had to purchase an air mattress as well as a new sleeping bag, and I slept in a small tent for about 4 nights. After a day or two there, one gets into a schedule. For me, it was up at about 4:30am just before the sun was up. The coyotes in the distance had stopped howling and the horizon was starting to brighten. It was time to put on digging clothes, crawl out of the tent, walk down to the pit and work for a few hours before having breakfast. After breakfast, I would go down into the pit for a few more hours, insuring that I had some water, suntan lotion, tools and my sun hat with the flaps over the ears and back of the neck, looking as if I was on some expedition in Egypt. Before lunchtime, the heat was too hot to continue working, so a break for lunch was required. At this time of the day, it is wise and more comfortable to stay under anything that provides shade and to talk to the others who were also digging. Hopefully, a dust devil would not swirl through camp, throwing everything not tied around and sending fine particles of sand everywhere; and that usually includes one's eyes, nose, mouth and ears. The best part of this was the show and tell - when others pulled Sunstone from their pockets to show what they had found. Stories were also told about what some had seen from others who had been digging. As the afternoon wears on, one could go back down into the pit at about 4pm and stay there for another hour or so before dinner. After dinner, as the sun starts to sink below the mountains in the distance causing light to fail prior to the sun actually setting, it was much cooler to work in the pit. After talking to others for a few hours, sometimes in complete darkness until 9-10pm in the evening up by the long house/trailers, it was time to go back to the tent and retire for the night. This scenario would play out once again at about 4:30am the next morning. This trip, in October, would be slightly different with the change in temperatures. 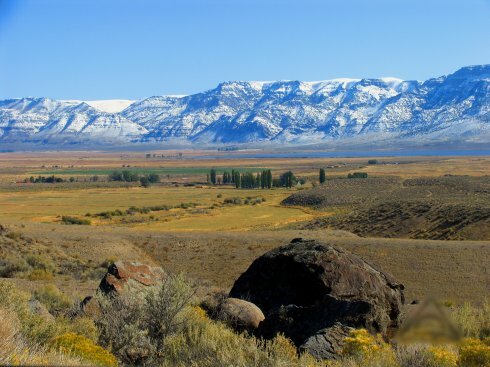 The mining areas usually close about mid October to late October, depending on the weather. The elevation is about 4,500 feet and the mornings were not the nice 50s as in July, but more like 30s, with potential snow if there was going to be any precipitation. 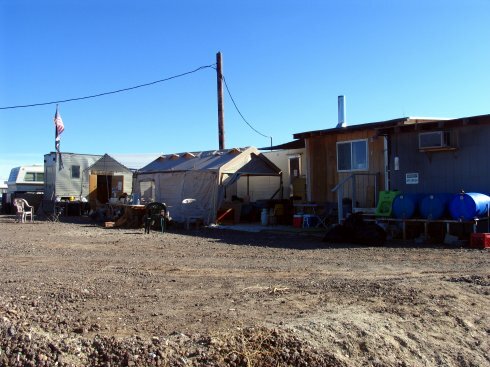 The living out in this area of the country is dusty, dry, hot or cold and just downright harsh. Water is very important. Everything, and I do mean everything, must be hauled/trucked in. 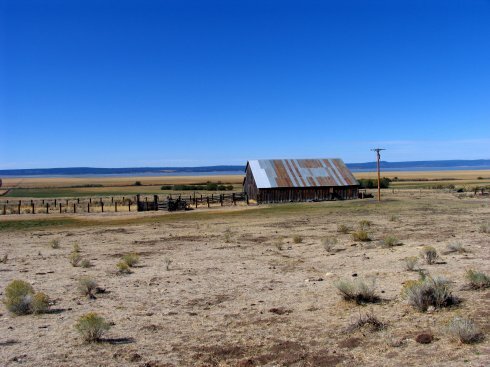 I think the reason why people return here is because of the beautiful drives through Oregon; the fact that the countryside changes every 30 minutes; the uniqueness of the high desert; the fact that one never knows what will be found when digging. Perhaps the uncertainty of the hunt and the hope for that very special piece of Sunstone brings people out to this large dry valley. 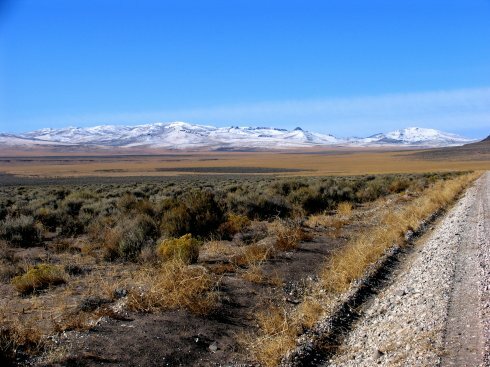 From Reno, it is about a 5-1/2 hour drive, with the largest city that one drives through being Alturas, CA and Lakeview, OR. One can obtain gas, lodging and food in Lakeview. I have found this a great place to stop on the way back from the mine, to wash the car down as it will be covered in fine dust. 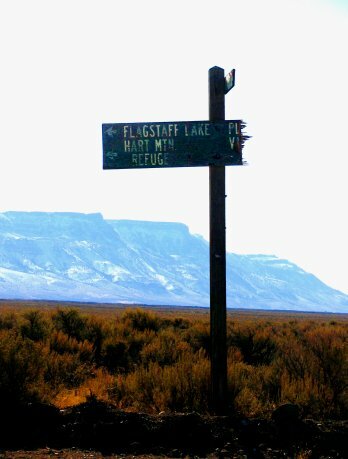 From Lakeview, there is still has a decent drive before one enters the 'town' of Plush, where one finds a general store and that is pretty much it. 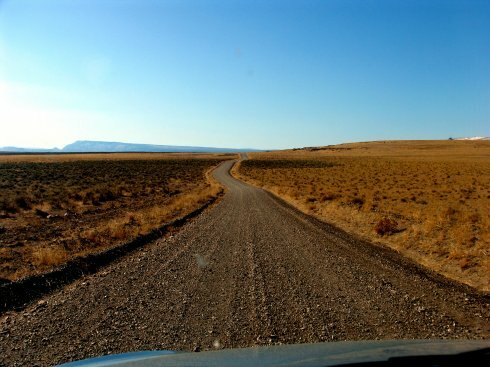 From Plush, there is another 25 or so miles to get to the sunstone areas, and about 20 miles of this is on dirt road. Depending on road conditions and the speed that one can feel comfortable or safe driving, the drive will be 30 or more minutes. 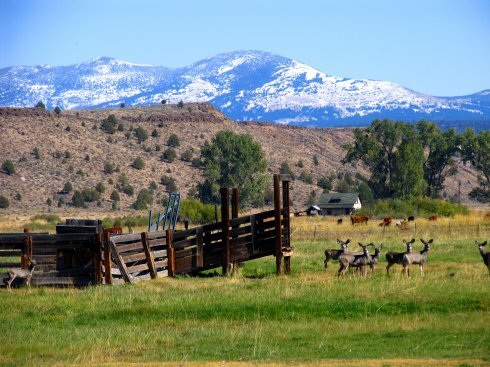 One is surrounded by mountains as you drive along flat lands on dirt roads. You might not be able to see a car off in the distance, but one knows that one is there because of the plumb of dust that is kicked up in back of the car. Dead snakes on the road can be common, and perhaps the one I saw was a rattlesnake. I would have normally stopped to look, but when one stops, the cloud of dirt catches up to the car and overtakes it. Stopping would mean getting out into a cloud of dust, breathing it in, etc. Heard that in years where the jack rabbits are plentiful, that as many as 10 or so could be running on both sides of the road and on the side of the car. As one gets closer to some that are in front, they tend to act as if the car is a predator, and then dart quickly at an angle and unfortunately, into the path of the car. One of the visitors this year indicated that one year, many jack rabbits didn't make it to the other side of the road, as they heard many thuds on the car as they made their way to the mining area. Accommodations were different than last year as sleeping in my very small two person (really like 3/person!) tent on a newly purchased air mattress and within an advanced technology sleeping bag, I would be staying in a trailer. Unfortunately, the trailer had no heat, running water or a working bathroom, and electricity for lights was available only when the main generator was working, which was sometime in the morning until about lights out (8pm or slightly later). Heating the trailer was done using the burners of the gas stove. There was a trick of using a clay flower pot to distribute the heat. 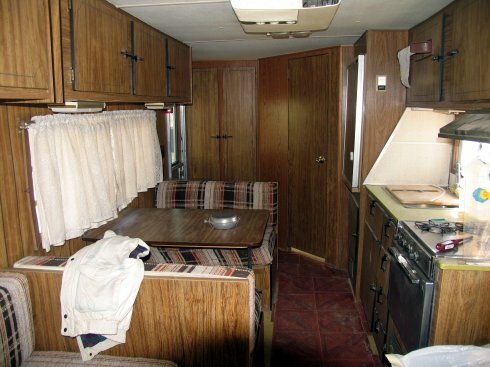 My first night of four, I heated the trailer with one burner (without the flower pot). The temp in the morning was about 48F. It didn't feel that cold - it was a dry cold! It did actually seem warmer than it would have been back in New England. The remainder of the nights were spent with two burners on and one of those had a flower pot. There were two distinct layers of warmth at different levels of the trailer. When standing, my shoulders to my head were quite warm, but when one sat down, the temperature seemed to drop about 20 degrees. With the two burners going, the temperature in the morning was a toasty 57F! The pit looked very different than the previous year. Like a living thing, the pit had grown, progressing west and also turning 90 degrees towards the north. Most of the people, as well as myself, were working this westerly wall. As people got further in to the wall, it was mandated that heavy equipment come in and break down any overhangs to protect those digging as debris or the actual wall could collapse and do serious damage or even kill a digger. People were finding sunstone with schiller and some color in this area, as well as the typical clears and lighter colors such as straw or yellow. I had brought up a 3-in-1 hand held tool that could be used as a jack hammer - one needs a small generator. It is interesting, as others also had similar tools and the small (and fairly heavy too) same brand name generator was quite common for those using power tools. 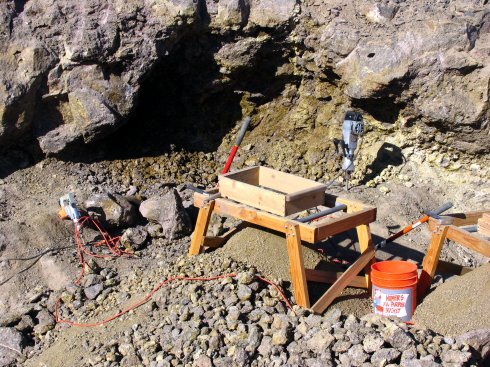 I borrowed tools from the Dust Devil, which included a shovel, bucket, small rock hammer/pick, screen. I had brought my own work gloves which as pretty much a necessity as it helps with callouses, but I did have an area of skin removed from my hand due to constant friction, and the fact that there were a few prickly pear cactus needles still in my gloves from home, didn't help, as they worked their way into my skin, irritating me during my work and causing swelling after all was said and done (Yes, there is a cactus that survives the winter in New England. It is a variety of prickly pear which has wonderfully large yellow blossoms and actually does well, though it dehydrates during the winter). There are many areas of decayed rock to work, so one removes what they can and then screens it. Once the smaller material has fallen through, one can hold the screen up to the sky to see if there is anything transparent, which would be sunstone. Many of the Sunstones are covered in dust, dirt, etc. so looking down on them, they look like the other rocks. Frequently, when working, sunstones which are located in situ (in place) can typically be readily seen when uncovered. One of the most incredible sights that I saw during my digs happened in about mid morning. The sun wasn't all that high due to the time of the year and the fact that I was down in the pit. I was scraping the top of a small overhang when a sunstone dropped down and positioned itself on top a pile of debris. The sunstone contained quite a bit of copper schiller, and the sun was hitting it just right to produce this glowing copper color in the sunlight. I was the first person to see this natural beauty since it's formation 6.5 million years ago! The night before leaving Reno for the Dust Devil, there was talk of a cold front coming down from Alaska. 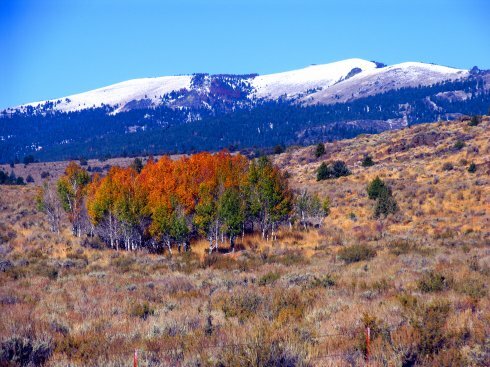 They were predicting snow at elevations over 5,000ft. Before it got dark on my first full day of digging, there were very fine flakes falling from the sky. 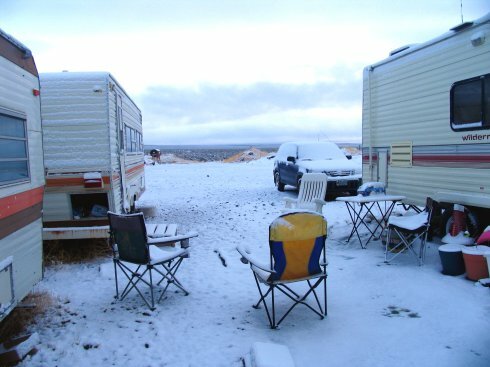 I awoke the next morning to find a few inches of snow on the ground. It was a different snow than what is normally seen back in New England. It was sort of roundish, looks like it was hard, but it was also fluffy at the same time. Digging for Sunstone when the ground was covered in snow was not that bad. It was difficult to walk around the pit, as one couldn't see the best rocks to step on as they were under just enough snow so as not to know if you should step on a particular rock or not. The temperature was fine once the sun came out, plus when one was working, it really did not seem cold. Again, since the humidity is very low, the temp that I was working at here felt warmer in Oregon, than if I were back home with higher humidity and at the same temperature. The one draw back to having some snow on the ground is when it starts to melt. It wasn't getting muddy, but the mix of snow and dirt would clog up ALL the treads in one's boots, and make it so the tread was useless and slippery, not to mention that if it came off when in a trailer, it would have to be cleaned up. I did bring rain gear that I had purchased for my white water rafting trip in the Grand Canyon back in 2004. I thought that I would work in the rain if necessary, as my time at the Devil was limited. I never needed it, but now that I think of it, attempting to dig in the rain, with all that debris, soil, sand, etc. it is sure to turn to mud and I can honestly say that it would be miserable to be there attempting to work in that kind of a mix. Needless to say, unlike my trip last July, there were actually very few people digging. Most of the people were part of the Dust Devil. Everyone eventually goes into the long house where there is a small kitchen, refrigerator, running water, and a wood stove. There is usually someone there to sit and chat with, and getting out of the wind and cold feels good. In the past, food was served - breakfast, lunch and dinner, at a small price. 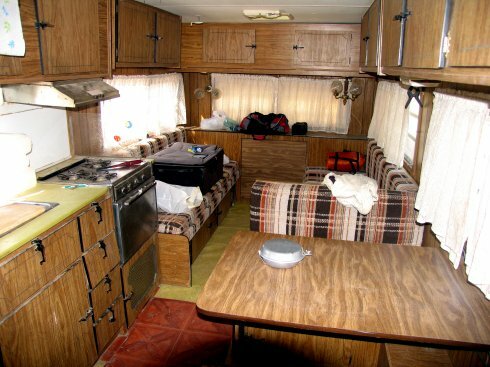 (This is no longer an option as they stopped doing meals) This was great for a person, such as myself, who has traveled 3000 miles and doesn't have a working trailer, stove, and most importantly, food! 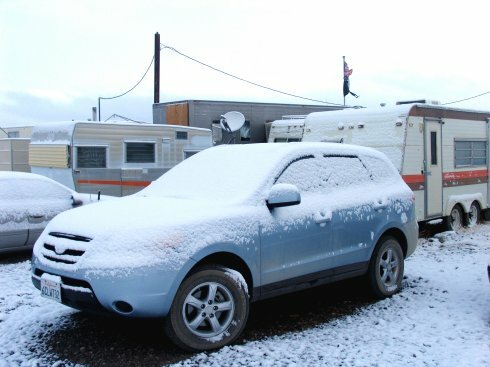 The trailer I was in provided shelter from the cold, provided some heat, as well as a stove to boil water. To make things easy, I had freeze dried food frequently used by those who hike and camp. All I had to do was heat up water to boiling (which didn't take too long due to the altitude, but the temp of the water was not exactly what I would call hot), add the hot water to the foil pouch containing whatever was for breakfast or dinner, seal it and wait about 5 minutes. Not the most tasty food, but in this type of environment under my existing conditions, it worked. Lunch was trail mix, fresh fruit and dried fruit that I had brought in from Reno, as well as fruit juice, gatorade and most importantly, water. 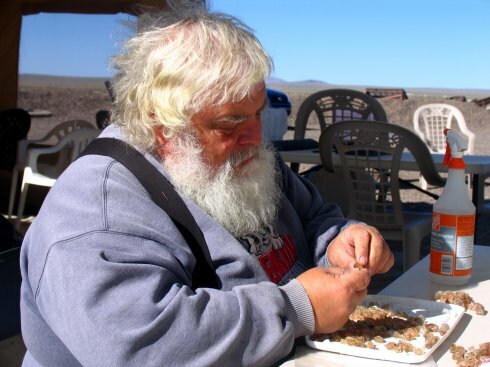 In just over 3 days of digging, about 7 hours per day, I found Sunstone that was clear, contained schiller and this time, unlike 2007, there were pieces that contained color. A few pieces contained heavy schiller. Sunstone is tricky and though one might think they have a wonderful red or schiller piece (or both! ), closer examination will probably prove that there are some inclusions or even a cleavage plane that will cause an issue with getting a large gemstone. Also, the orientation of the schiller or the actual thickness of the piece will cause issues and make the piece much smaller in its faceted state or not even useable. As indicated above, due to inclusions, thickness, orientation, cleavage issues, etc. the number of pieces that can produce All That Glitters high quality gemstones, is very limited. 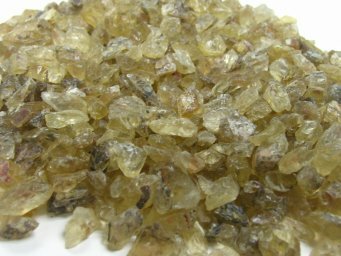 Like most rough gemstones, quantity is very different than quality, and the fine material is a very small fraction of 2% which is the average said to be associated with gemstone rough when compared to all the gem material removed from a mining location. 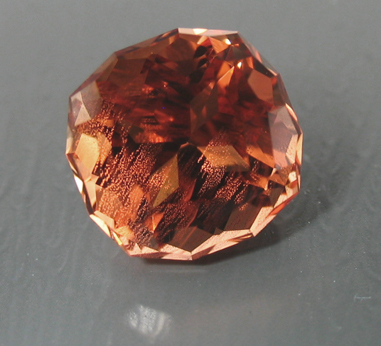 Of all the pieces we did return with, my master cutter and I looked at every piece, choose one, trimmed it, and he faceted a nice orangy 3.90ct squarish cushion. This piece has schiller, but not enough to actively see the glitter or affect the transparency. Currently, this gemstone may appear in the 2nd edition of a book on gemstones by Keith Wallis. One pays the Dust Devil for the better/best material that is found. The clears are free. So, Don will sit down with someone before they leave to go over their material and figure out what is there and what the cost will be. No one has to take the material they found, but the better material has a value and it is up to the digger to determine if it is worth it for them, otherwise, the mine gets to keep what is found. As Don said a few times - "Go out there and make me some money!". Yes, digging is free and it is nice of the Dust Devil to allow anyone onto the property to dig. They have bills to pay, and to keep that place open costs money. 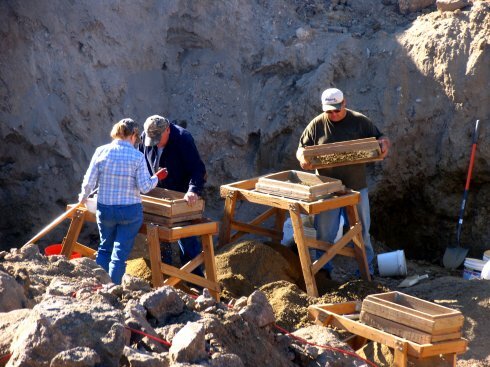 Those who dig help to keep the mining business operating by the fees paid for the better material that they find. The mine doesn't entirely depend on collectors, cutters or lapidarists to keep the mine open. They have all the heavy equipment that one expects at a mine. In fact, they even have an optical sorter, one of only a few in the world. 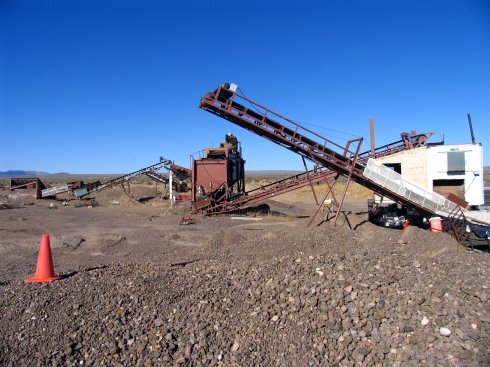 They load a conveyor belt with rock containing sunstone. The belt runs at a constant rate and drops material to a lower level. 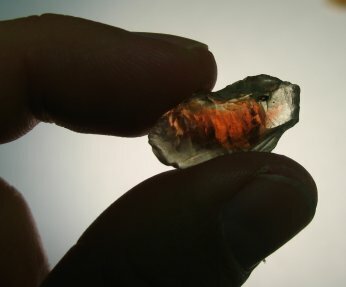 An infra-red scanner views the material, and when a transparent fragment of sunstone is seen, multiple air jets blow that particular piece off to the side to be collected. The other material continues to run on the belt and will be discarded. Not the best signage, but something. The GPS that I was using was useless as it showed that I was not driving on any existing roads. The GPS might have been set up to avoid dirt roads, but I would have thought that dirt roads would still be visible. Looks great, but there are a number of issues which would allow only a small gemstone to be realized. Not something that All That Glitters would facet.